Our Portable BBQ Grill Hunt hits paydirt! Over the last couple years we've tried a few portable BBQ grills for our RV Boondocking. Most started out OK but problems developed over time. One was just so poorly built, it wore out in not much more than a season, even if it did work well at first. Even if they worked out for quality and function... their shapes just haven't fit into our 'system'. Somehow they just wouldn't fit well into our compartments, their quaility proved lacking... always something. And not one of them.... improved my cooking! The last one was a Coleman portable BBQ grill, and I figured it was just about right. It had the Coleman quality I've grown used to... we've used Coleman lanterns and camp stoves for years. I can't remember ever having one wear out! Though we gave most of that gear away when we moved from tents to RV's; We do still carry a Coleman stove and a couple lanterns! The problem that cropped up with that last Coleman stove was in a way, unexpected. It was a Coleman RoadTrip grill. Pretty cool setup. 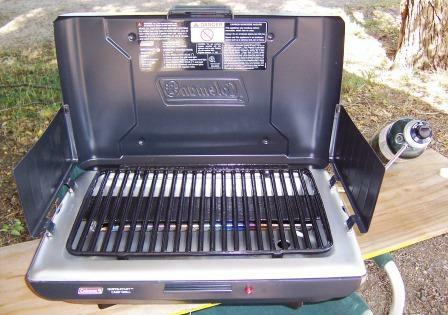 It has a built in stand, so you don't need a table to set it on, to have it at a comfortable height to grill on. Even though it wouldn't fit into a compartment, (one of my previous requirements) because of it's length, I thought it would still work well because it could stand alone... good for boondocking? It would seem the perfect RV grilling machine right? For some, I it would be. It all depends on where and how you travel I guess. That, and a proper place to store it. For us, that problem came to light on a trip to Yellowstone. Our Jayco doesn't have any storage compartments that allow us to store it easily. So, since we like to spend quite a bit of time... in bear country... Yellowstone, Glacier.... etc.... storing the thing became an issue. In more southerly camps, where you can leave your grill out... no problem... up in Grizzly country it becomes a real hassle if the portable BBQ grill doesn't 'store away' easily. Even if you did escape the 'pleasure' of seeing a 1000# Grizzly tearing your grill apart, sitting out there in front of your RV camp... I'm pretty certain, the $$$ fine the Rangers are going to hit you with will most likely be pretty uncomfortable... especially with the Boss lady sayin' "I told you so!" So, I figured it was back to the fairly compact, but still 'awkward' to store, portable BBQ units we'd been using. Then, here a few weeks ago, we were browsing through the Bass Pro Shop store down in Denver... Oh boy, if you've never been to one.... even makes a frugal Ol' tightwad like me drool! Anyway, I stumbled across a new lightweight and portable coleman BBQ grill! This one is built so it looks a lot like their classic camp stoves. 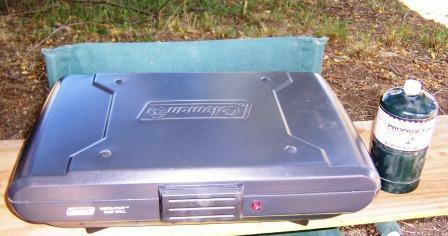 It's easy to store in our cluttered storage compartments and has a heavy duty, grill surface. For you guys with the big cargo bays you can roll an ATV into, this is all real boring. But for us that need to put 10 lbs. in a 5 lb. 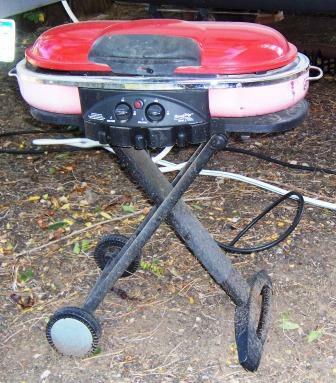 sack, this lightweight and portable grill is a good deal! Coleman calls it the PerfectFlow™ InstaStart™ Propane Camp Grill. Coleman quality, compact, quick and easy to fold up and store. It's smooth, clean, shape makes it easy to fit into crowded storage compartments like ours. No big handles or odd shapes. I hate to make predictions... but I do believe, finally, I've found the portable BBQ grill that fills the bill!.... Now... if only they could come up with a Lightweight and portable BBQ grill that would automatically improve my cooking!